Looking back 13-billion years into our universe's past, a group of scientists first discovered the monster COSMOS-AzTEC-1 galaxy using the James Clerk Maxwell Telescope in Hawai'i and later followed up with observations using the Large Millimeter Telescope (LMT) in Mexico and the Atacama Large Millimeter /submillimeter Array (ALMA) in Chile. What they found was astonishing: not only was this galaxy forming stars at an unexpectedly high rate, but the clouds that fuel the birth of stars were unusual as well. Galaxies that form stars at higher rates are called starburst galaxies, and COSMOS-AzTEC-1 seemed to fit that archetype. However, in starburst galaxies, the star-formation predominantly occurs at the center of the galaxy. Surprisingly, astronomers detected two massive clouds of gas several thousand light-years away from where they thought the star-formation should be concentrated. When they investigated more closely, they found that the gas in COSMOS-AzTEC-1 is extremely unstable, fueling runaway star-formation, and turning it into a monster galaxy. And yet, when scientists attempted to model this galaxy, their computer simulations could not explain all of its characteristics. Simply put, COSMOS-AzTEC-1 shouldn't exist. The international team of scientists, led by Dr. Ken-ichi Tadaki from the National Astronomical Observatory of Japan, that discovered COSMOS-AzTEC-1 published their findings in Nature on Wednesday, reporting that they achieved unprecedented angular resolution by observing the galaxy with ALMA. Poor resolution has impeded studies of submillimeter-bright galaxies in the early universe and has been an obstacle to understanding their physical and dynamical properties. Studying galaxies like COSMOS-AzTEC-1 is important, as they are thought to be the ancient predecessors of massive galaxies in the present universe, and the improved resolution has revealed several unexpected findings. In addition to the mysterious off-center clouds, COSMOS-AzTEC-1 has a regularly rotating, ordered gas disk instead of a more chaotic distribution, which is what scientists expected. Not only does this complicate the common model of early galaxy evolution, but it makes future high-resolution observations of similar galaxies an imperative. 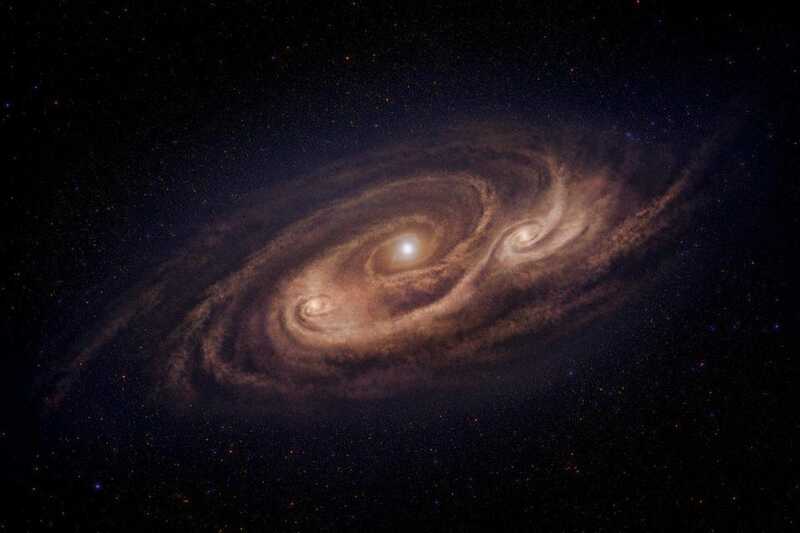 Thankfully, the ALMA observations didn't just raise more puzzles for scientists to solve; they also answered many long-standing questions about the nature of galaxies in the early universe. Before ALMA, astronomers knew that massive, young galaxies existed just 1 billion years after the Big Bang, but they were unable to answer how these galaxies formed or how they were able to stockpile massive reserves of gas so quickly. One of the clues that this research team uncovered was hidden in the nature of COSMOS-AzTEC-1's gas clouds, a feature that was previously unable to be observed. In normal galaxies, the gas clouds are in equilibrium; the gravity pulling the cloud inward is balanced by the gaseous pressure pushing outwards. Given the right environmental conditions, the gravity eventually becomes stronger than the pressure, causing the cloud to collapse, become extremely dense, and begin to form stars. These stars and their eventual supernovae increase the outward pressure within the gas, stabilizing it, and regulating the rate of star formation. In COSMOS-AzTEC-1, the gas clouds are extremely unstable, and the outward pressure is significantly weaker than the gravity, which prevents any of the aforementioned stabilization. Instead, COSMOS-AzTEC-1 has a runaway star-formation rate over 1000 times that of our Milky Way galaxy and Tadaki's team estimates it will run out of gas in just 100 million years. 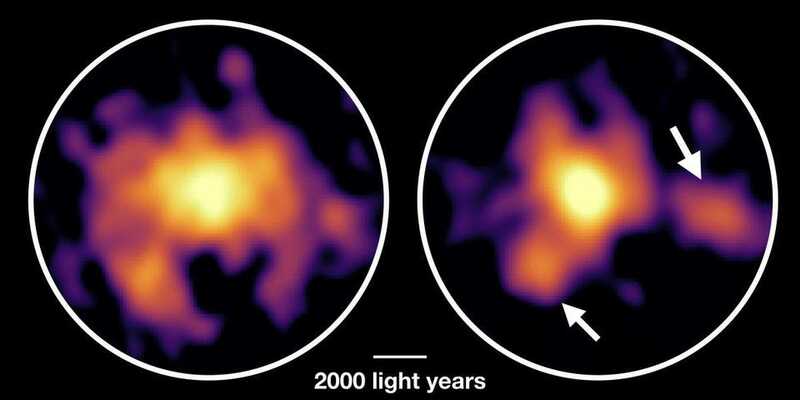 The mechanism that causes COSMOS-AzTEC-1's gas instability remains unclear. Tadaki and his colleagues hypothesize that it could be caused by a galaxy merger: a collision between two or more galaxies that can transport gas efficiently throughout the galaxy and can initiate a burst of star-formation. However, their current observations didn't detect any of the signs of such an event, and a merger wouldn't entirely explain how COSMOS-AzTEC-1 was able to keep its enormous surplus of gas from becoming stars before it began its starburst period. Despite the lingering questions though, Tadaki and his team's research is a perfect example of how technological improvements will find the solutions to long-standing scientific mysteries and reveal unexpected secrets hidden throughout our universe.